If you are looking for the best of both then a dual fuel range cooker is spot on. Combining the responsive cooking power of gas with the controllable, even baking performance of an electric oven, our dual fuel range promises powerful performance and flexibility. Choose a width to suit your kitchen design, from 70cm up to 120cm wide. Originally, range cookers were limited on their cooking style with the main function being to heat the kitchen and slow cook family meals. Your cooking choices were limited to ‘hot’ or ‘hotter’ in the two, usually small, ovens. Older designs used to take up a lot of room for not a lot of function. With a modern design, in the same 90cm space you can combine multiple hob zones instead of just two hot plates, larger more capacious oven cooking space and even a storage drawer to tidy away baking trays and roasting dishes out of site until you need them. Now, with the introduction of modern cooking technology, you can expect to find the intricate cooking functions and performance features of a modern fan oven on our range of freestanding cookers. You needn’t sacrifice grilling, fan or conventional cooking, browning, warming, blind-baking or defrosting simply for choosing this style. 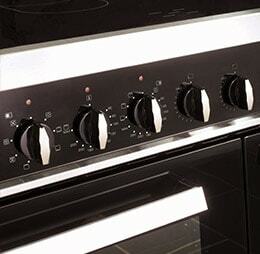 The control panel allows you to select the function and the temperature just as you would on a single oven. 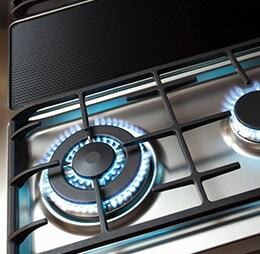 Dual fuel offers the best of both with electric fan ovens being much faster than gas or conventional and gas hob cooking being the most responsive style available. If you want family meals in a hurry, the dual fuel models with provide everything you need, as quickly as you need it. With an electronically programmable dual fuel range cooker, you can pre-programme jacket potatoes to start cooking at 3.30pm so that they are ready for the children’s tea at 5.00pm, or set your cake to bake for 25 minutes so that you don’t forget it is in there while you are tidying up. The opportunities are endless for making this appliance work harder for your home so that you can enjoy more free time and less stress. Not forgetting when Christmas comes around and every chair in the house is in use. You will be able to manage the roast and all its trimmings with ease, and even squeeze in starters and puddings that need cooking simultaneously. Your family and friends will wonder how you did it! There is a good reason why many professional kitchens have range cookers, with their ample oven space and separate compartments to cook at different temperatures simultaneously. A professional kitchen wouldn’t be what it is without a large range of gas burners to cook on either and our range cookers have just that. Combining the best of solid, cast iron constructed, gas powered hob top cooking and accurate and controllable electric ovens, the dual fuel range cookers are our most popular models for customers. 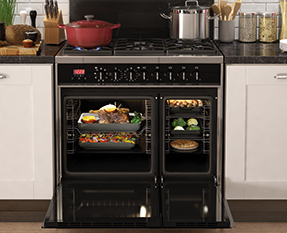 Take a look at some of the exciting features in this range like built-in storage drawers to keep your kitchen clutter-free, wok burners with cast iron supports provide extra cooking power when you need it as well as a ceramic griddle on the RV1200 that allows you to BBQ indoors and cook steaks to perfection.